During the two weeks I deactivated my Twitter account, I was reduced to trolling people the good ol’ fashioned analog way: with T-shirts. This time my victims were the “liberal elites” in Los Angeles. After two Twitter followers bought me Tucker Carlson T-shirts, I decided to test the bubble out and wore my T-shirt everywhere I went in L.A. for a week—and I made sure to make my week as #whitefeminist as I possibly could, so I went to spin class, farmer’s markets, yoga, Starbucks, and organic juice bars all over town. The results were fascinating. My anecdotal evidence is far from scientific, but my findings were revealing. Perhaps it’s because he lost his signature bowtie, but what struck me was that out of dozens of people that I polled, only one person recognized the image on my shirt as Tucker Carlson. I’d have to wear a Maddow shirt in Trumpland to really test the bubble theory out, but I’d hedge a guess that more people would recognize Maddow in red states than people recognize Tucker in blue states. According to recent ratings, Tucker has the third most-watched cable news program, just behind Sean Hannity and Maddow. Hannity gets an average of 3.27 million viewers, which sounds like a lot but in actuality it’s less than 1 percent of the population of America. It’s hard to tell whether Tucker’s lack of recognition is due to the bubble effect or the fact that when you actually drill down on the numbers, not many people watch cable news. A lot of people asked me who it was, and these interactions were hilarious. “Who’s that on your shirt?” a young woman in Lululemon asks. “Who’s he?” as she sips on her juice. At the very mention of the word “Fox” the woman abruptly turns on her heel and walks away. “Is that your boyfriend?” a man handing out flyers asks. “Yes, he makes me wear a T-shirt with his face on it so everyone knows I’m his property,” I reply. “Wow. Smart guy.” He says, in seriousness. “No, he has a show on Fox News,” I explain. “Oh well, same thing,” he says, laughing. “Who is that?” a young-looking millennial asks as we wait for class to start. “Oh, so you’re a racist,” she jokes, not joking, and walks away. 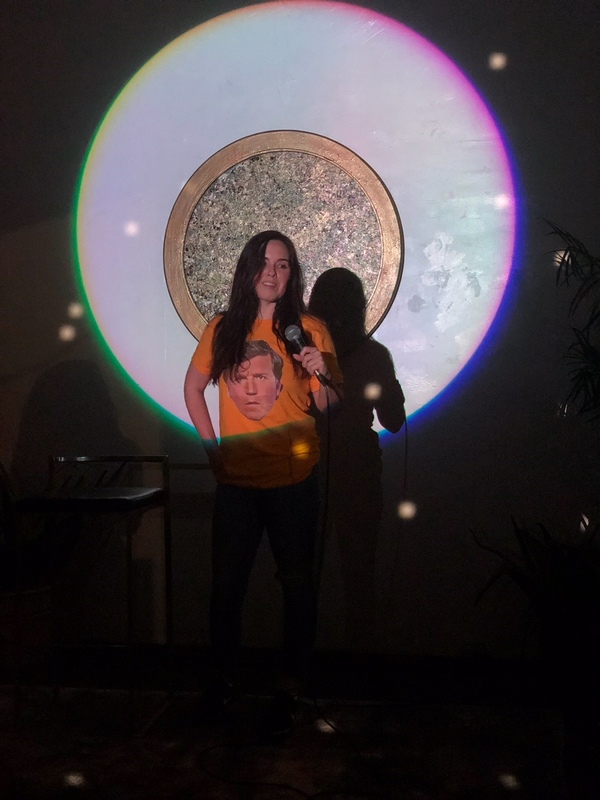 “Who knows who this is on my shirt?” I ask approximately 30 people in the audience at a comedy show I am hosting. “Who’s Tucker Carlson?” an audience member asks. A homeless man wearing a T-shirt that says, “Radical Integrity” walks by and yells, “F-ck you! !” I’m still not sure if he knew who was on my shirt, or just didn’t like the looks of me, but I probably deserved that. Only one man appreciates my tee all week: a guy driving a Mercedes yells, “I love your shirt!” as he drives by. Bubbles, how do they work? Immediately following the Trump victory, much ado was made about the “liberal bubble.” Thousands of think pieces were written about the topic, opinion writers everywhere asked “what happened on election day” and struggled to comprehend how they could have been so wrong. One would hope with all of this self-reflection, the “elites” would have made an effort to diversify their media diet to include some portions from outside the mainstream media. In fact, it appears the bubble has become even smaller. From 2005 to 2008, he hosted an evening show on MSNBC called “Tucker.” In 2006, he was on “Dancing with the Stars,” for crying out loud, although you probably didn’t see that unless you were in a nursing home. If you’re going to be a part of the #resistance, I’d say it’s important to do some opposition research and know thine enemy. From the looks of it, the “Saturday Night Live” bubble sketch is closer to reality than satire, but then again, so is everything now.